B. Thomas (Arlington, Texas, United States) on 30 September 2010 in Animal & Insect. 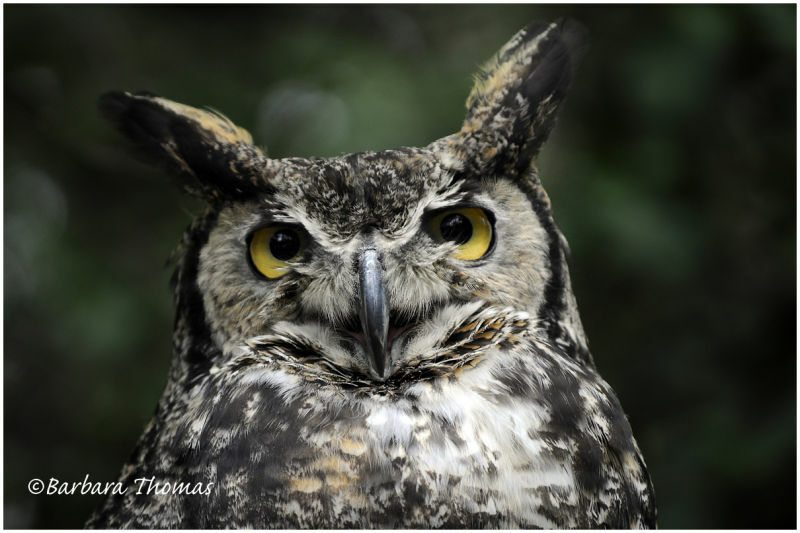 Great Horned Owls have spectacular vision allowing them to pinpoint prey and see in low light. The eyes of Great Horned Owls are nearly as large as those of humans and are immobile within their circular bone sockets. Instead of turning their eyes, they turn their heads. Therefore, their neck must be able to turn a full 270 degrees in order to see in other directions without moving its entire body. Fantastic portrait , lovely details and those eyes ...Phil. this is cool:) love its bright eyes,very nicely seen and captured! Wow! I love those intense and amazingly clear eyes!!! A gorgeous bird! oh my god! this is real brilliant!!! I know you are probably a COwboy fan but this Owl could be an assett to the "Who Dat" group further south and to the east ;-) Nevertheless and notwithstanding, I LOVE Owls!!! Wonderful job Barbara! @Denny Jump Photo: Thanks. Owls are so cool. Don't you love their eyes. ps -and yes, they bring new meaning to the phrase "keep your head on a swivel"
Un superbe portrait animalier !!! félicitation sur le niveau de détail !! Le bokhe est très réussi ! Oh, wonderful shot, Barbara. Love it. The close up is excellent, including color and detail. 5 stars *****In my book, I found this owl, among some other species of owls. Have a nice evening and all the best. Thank you for your nice comment. @Judy aka L@dybug: Thanks, Judy. He was so beautiful. beautiful portrait Barbara! I worked with these beautiful birds at MASS. Audubon! They are very smart! We had a Great horned that we had to bring to the vet, eye specialist, for cataract surgery! The Talons will do a lot of damage! This certain owl would bring me a mouse in his beak ,and put it in front of me, and do a little dance, like he was providing food for me! We fed them dead mice every day. He lived 22 years in captivity! I miss him very much. @Wild Mustang Photography: Wow, that's so neat that you got to do that. This guy was injured also, and was with a woman who saves and releases injured birds of prey. I hope he gets to fly again. excelente captura, me encantan estas aves! A gorgeous portrait - wonderful image ! Nice head shot. The eyes are mesmerizing. my favorite shot of the day!! amazing creature. beautiful beyond description. raptors are COOL!! !